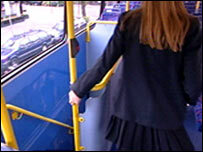 Crime on London buses soared over two years, according to a report from the London Assembly. But Transport for London (TfL) said the report was "misleading" and the most up-to-date statistics showed there were fewer crimes on buses than in 2004. Assembly report figures show crime rates increased 15% from 2004-5 to 2006-7, with a 2% decrease in 2006-7. TfL compared figures from April to September 2007 with the previous year which showed an 11% drop in crime. According to TfL, in the first half of 2007-8 there were 15 crimes per million passenger journeys compared with 18 in the same period in 2004-5. TfL said: "We are confident that we will deliver a continued downward trend in the coming months and years". The assembly report showed crime rates rose from about 33,500 in 2004-5 to just over 39,000 in 2005-6, and then dropped by about 500 in 2006-7. Between 2004-5 and 2005-6 criminal damage rose by 41%, robbery increased 39% and violence against a person rose 11%. The assembly made several recommendations including improving CCTV and training for drivers. However, it did praise TfL's initiatives to reassure passengers by increasing the uniformed presence on buses, using technology to prevent and solve crime, and the introduction of smartcards for youngsters. Roger Evans, chair of the Assembly's Transport Committee, said: "Anti-social behaviour and crime on buses remain a real concern for passengers. "We welcome the greater police presence and the use of CCTV but other steps can be taken to safeguard passengers and our report makes a number of constructive recommendations."